Christmas Puppy:: Awesome Christmas Puppy Shirts and More! Christmas Puppy shirts and gifts just in time for the holidays! 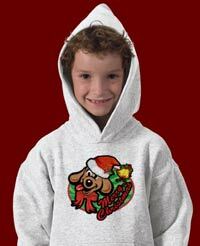 Adorable Christmas Puppy design features rich Christmas colors and an overly happy little puppy toon. Christmas Puppy is all about the fun and excitement of the holidays. Our Christmas Puppy design features bold and bright holiday colors that just can't help but spread the spirit of the season. Christmas Puppy features our cartoon graphic puppy wearing an awesome Santa's hat and all the other cool decorations of Christmas. Merry Christmas frames the bottom edge in cheery red while the background is an explosion of minty greens. 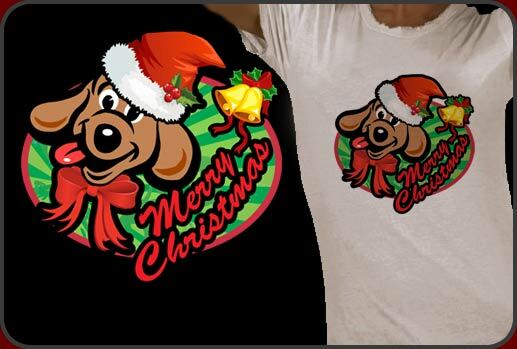 Our Christmas Puppy design prints perfectly on any shirt color you choose. Try it before you buy it, select any color you like and you can see what the design looks like in that color! Nothing could be easier!